At Harland Clarke, a single strategy drives everything we do: help you better engage with your customers. To earn their trust. To deepen your relationship. To keep you first in their minds. It’s been true for over 140 years, and it’s more true today than it’s ever been. All around us, new technologies are changing the way we live and work, changing consumer expectations and raising the bar on what best-in-class customer engagement is all about. We’re helping clients embrace this change and creating a new era of customer engagement that transforms challenges into opportunities. Our solutions are designed to help you tap into the power of customer engagement in new and exciting ways to ensure your strategic business growth and sustained, long-term success. Why do clients trust us with their most important initiatives? We live and breathe integrated, data-driven marketing. We’re invested in leading-edge technology to deliver an exceptional customer experience. We apply rigorous data security protocols to everything we do. We’re unwavering in our commitment to delighting our clients. Building engagement and putting you first in your customers’ minds. That’s what you want. And that’s what we do. 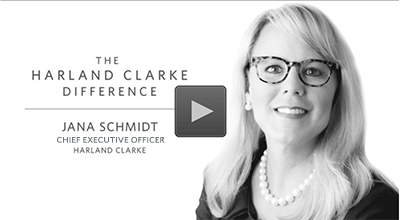 Watch The Harland Clarke Difference video hosted by Jana Schmidt, CEO of Harland Clarke. 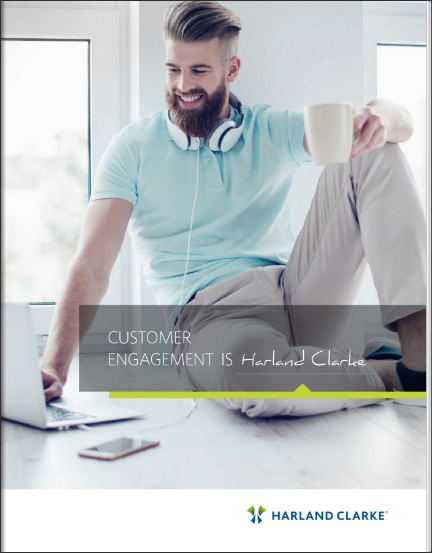 Read our solutions overview Customer Engagement is Harland Clarke.